C&IT's Best UK Conference Venue award was won by NH Hotel Group's nhow Berlin after 2015 was one of its most successful years to date. 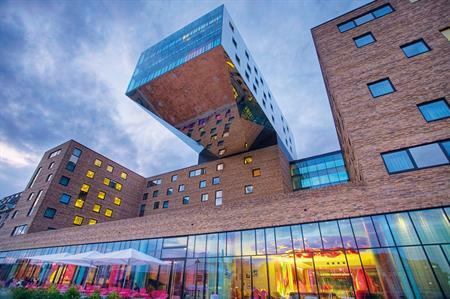 It’s known as a music and lifestyle hotel, but this hasn’t stopped the NH Hotel Group's nhow Berlin from achieving major kudos in the conference world. In fact 2015 was one of the most successful years to date, with the venue holding a total of 577 events and the average revenue per event rising by 18 % year-on-year. Praised for its use of technology, the 964 m² conference centre boasts 3D Hologram technology, allowing customers to play presentations in 3D or show a life-size hologram to an audience. The centre is also home to several food and beverage outlets, including the Envy bar and the Fabrics restaurant, which has river-side terraces. With room for 750 people in its largest space, all meeting rooms have a flexible layout, and can be combined for large-scale automotive presentations. Opened in 2010, the venue is dedicated to music, providing a quirky conference venue for international delegates. Concert night and DJ events are held on a regular basis, while an in house music manager can assist delegates.